What Is Factory Reset Protection(FRP)? 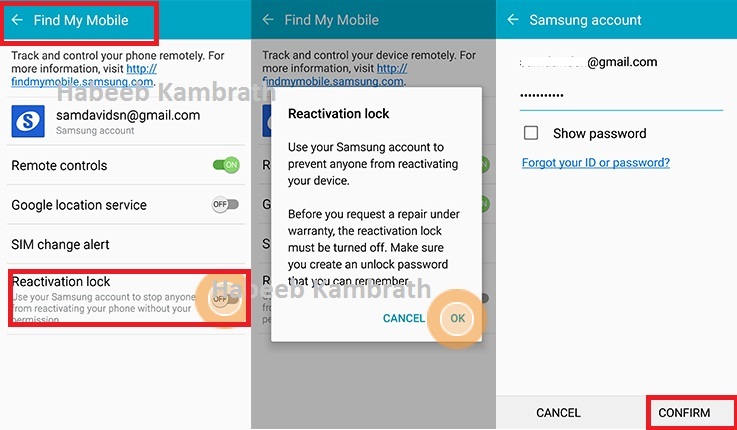 Android Factory Reset Protection (FRP) is a new feature to protect your device which has been added to several Samsung devices that are running Android OS 5.1 or higher. 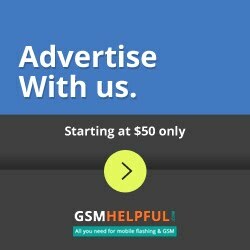 This feature allows you to set up your device to prevent other people from using it if it's been reset to factory settings without your permission. For example, if your device is lost, stolen, flashed, or wiped, only someone with your Google account or screen lock information can perform a factory data reset and use the device. If you reset your device to factory settings with the Factory Reset Protection (FRP) feature turned on, you must enter the user name and password for the last registered Google Account to regain access to the device. You will not be able to access the device without the correct credentials. This Google account verification prevents unauthorized users from accessing or using your device if it has been reset to factory settings without your permission (for example, if your device is lost or stolen). 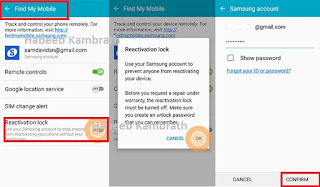 You should remove your Google account before shipping your device to Samsung or any other service provider for service and before resetting the device to factory settings. *Scroll to the System section and tap Security. *To enable Reactivation lock, scroll to and tap to check Reactivation lock. 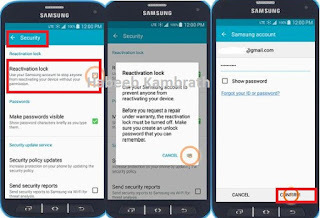 *Review the Reactivation lock prompt and tap OK.
*Enter the Samsung Account password then tap CONFIRM. *The Reactivation lock feature has been enabled. *Touch Lock screen and security. *Touch the slider OFF to turn Reactivation lock ON. *Review the information and touch OK.
*When resetting your device, you will be prompted to confirm your Samsung account password. *Your device will reboot and reset. How To Disable Reactivation Lock. *Tap to uncheck Reactivation lock. 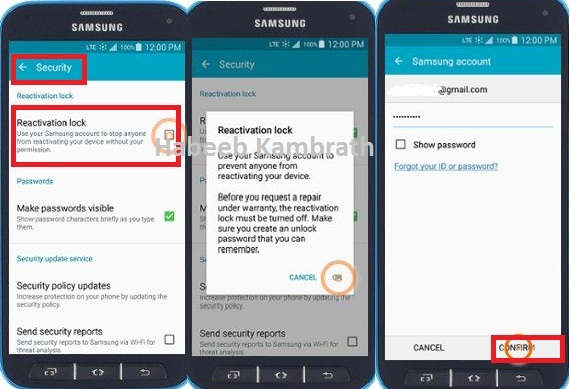 *Review the Turn off Reactivation lock prompt and tap OK.
*Enter the Samsung Account password, then tap CONFIRM. *The Reactivation lock feature has been disabled.